The smoked substance takes two or even three main forms. The first one is the mu'essel, an Arabic word for tobamel (i.e. "tob"acco plus "mel", that is Honey in Latin). So, literally, it means "honeyed", named so because of its ingredients like treacle (molasses) or honey used as agglutinant bonds. Treacle (molasses) is a sugar by-product. 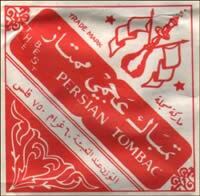 The second form is "tumbâk" which is pure tobacco. "Jurâk", mainly of Indian origin, can be considered as an intermediate substance among both first ones. It is very appreciated in the Arabian peninsula. Fruits and oils would be some of its ingredients. However, one sometimes names jurâk a treacled but not flavoured tobacco that certain users would rather smoke. 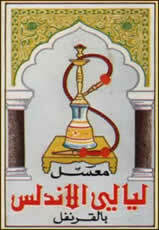 Egyptian "Zeglûl" and Tunisian "Shîh 'el-beled" are brands of this product, particularly appreciated by its amateurs. Mu'essel. The mu'essel is particularly intended for shîsha. As we said, it is a mixture of tobacco and treacle, or honey or, sometimes, sugar and distilled water, in a proportion of one for two and half to which some glycerin and different essences are added. The latter confer on tobacco extremely varied tastes and flavours: apple (very common); strawberry (Egyptian brands "'En-nahla" and "'Ibyâry"); mint ("'El-'Esfahâny" brand, named after the Iranian city Ispahan); etc. There is an ever-increasing choice: grape; watermelon; melon; rose (Egyptian brand "'el-'Araby/'Abajûra"); liquorice ("'El-bâshâ" brand: literally, "The Pasha"). An amateur in France told us he used basil and Honoré de Balzac mentioned patchouli in the nineteenth century… In certain countries, choice is limited. This is the case of Jordan where, till recently, the leading product, sometimes the only one on the market, served in cafes and restaurants, has been "Bahreyny". By the way, let us make it clear here, the latter is not inevitably manufactured in Bahreyn. Mu'essel is sold in cardboard boxes or plastic jars. Packagings are generally illustrated with ruddy floral motives representing fruits or gardens with elegant sultans or pashas… The relative proportions of tobacco, treacle, fruits and spices are from now on supplied to the consumer, that is, on average, 30 %, 50 % and 20 % respectively. The substance is generally valid for two years; boxes usually indicate the production date. Classic health warnings about lung cancer risks and cardiovascular diseases, now world-wide known by all cigarettes smokers, appeared for a long time now. Tumbâk. It is a word of Turkish origin. The Persian one is close: "tumbeki". The word "tutun" is sometimes used. Tumbâk belongs to the variety named Nicotiana Alata Persica, of the sub-genus Petunioïdes of the Nicotiana Tabacum species. Tumbâk contains many alkaloids among which nicotine. The most used at present is called "'ajamy". It is produced in several countries of the Middle East. In broad outline, the smoker moistens it, presses it several times in the hand then cleans it and finally fills the pipe bowl with it. The use of charcoal in the bowl generates a rather high level of carbon monoxyde. It is therefore preferable to smoke in a well aerated place. Certainly, by "washing" the smoke, the narghile clears the latter of a certain number of harmful constituents such as acrolein, aldehydes and others cancer causing substances. However, the lowering of the nicotine rate, around which a sort of "myth" has been built, was recently questioned by a study. The latter established that the quantity of the alkaloid retained in water remains relative, especially when the smoker compensates, in other words, proportions, unconsciously, her or his smoke. Anyway, in the absence of definitive results, solutions exist or remain to be found in order to make narghile even more "hygienic". For example, an electrical ignition system could possibly eliminate the carbon monoxyde production and absorption risk caused by the glowing embers. As for mouth-to-mouth possible contamination, however often exaggerated, disposable plastic nozzles are nowadays widespread.